The photographer diving with whales. Image taken from Studio Cosmos. Many have seen a whale or two, but how many have swam with whales in their natural habitat? Photographer Bryan Austin may be the only lucky and brave one to swim and float within no more than six feet of these amazing enormous creatures. Austin takes hundreds of photographs of these mammals up close, then puts them together to form a life-size image, one of which is 6 feet tall by 20 feet wide (pictured below). 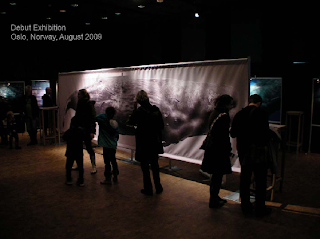 Austin's debut exhibition in Oslo, Norway. Image from Planet Green. Working so intimately with these mammal weighing fifty to one hundred tons is extremely dangerous and delicate, so Austin always let the whales dictate the terms of his visits. Taking up to three months to capture these images, Austin would float above a whale pod and wait for a whale to approach him. "Austin was six feet in front of a humpback whale calf when he felt a gentle tap on his shoulder -- he turned to face the eye of the mother. She extended her 15-foot, one-ton pectoral fin to gently let him know that she was watching him. It was at this moment, when Austin locked eyes with the mother whale, that he realized what had been missing in the field of whale photography and conservation, an emotional connection…mammal-to-mammal, species to species." 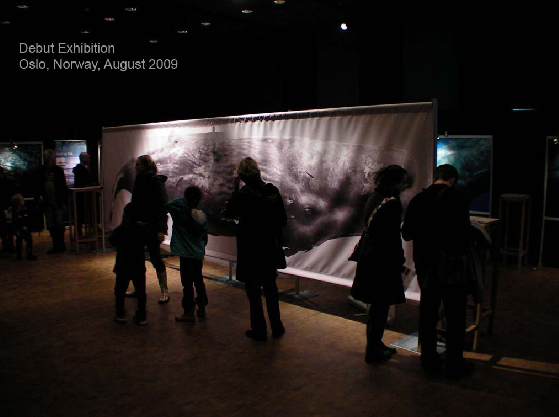 The photographer now tours heavy whaling nations like Norway and Japan in hopes that these life-sized images would help the audience relate to these endangered animals - to see that they are living beings just like us, and possibly slow or stop whaling. See more amazing images at Bryan Austin's site, Studio Cosmos, and a more detailed slideshow narrative of the project at Planet Green.